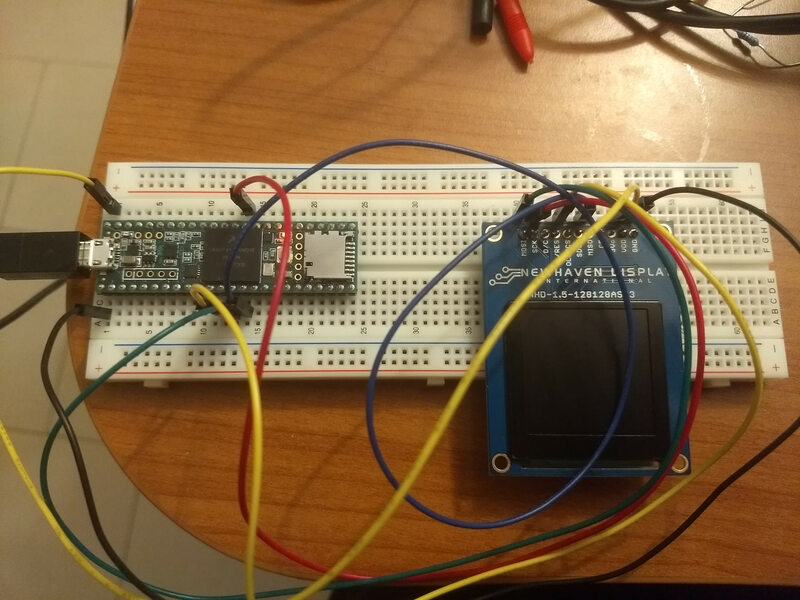 I am trying to get my OLED (NHD-1.5-128128ASC3) works with a Teensy 3.6 using the following library: https://github.com/kirberich/teensy_ssd1351 and using the examples provided with it. Despite I tried a lot of different settings I can not get anything out of it, the display seems completely dead. I've already checked twice wiring and it seems ok, I've checked with my DMM if the display is receiving the right voltage (about 4.75V) and checked CLK, SS, MOSI and MISO with an oscilloscope, and they seem to have sense. So I cannot understand what it is wrong with that. 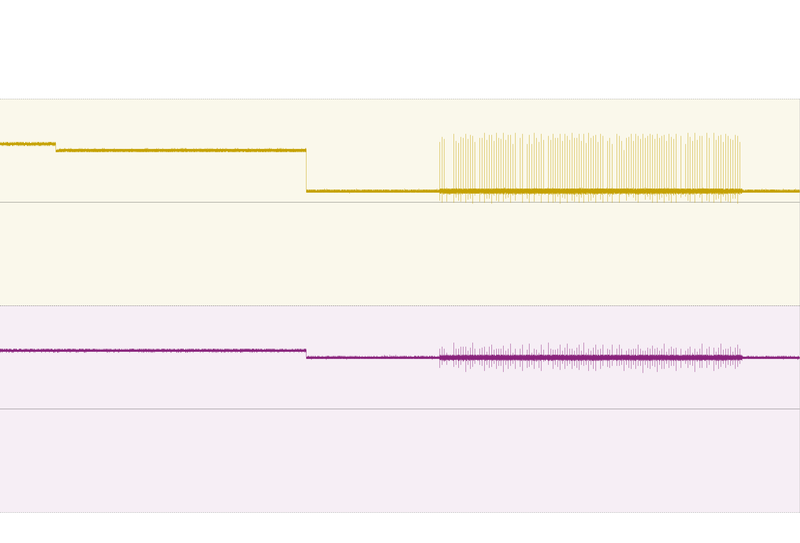 Anyway I have noticed that CD and 3Vo seems have a shortage with GND (checking using the continuity checker of my DMM), even if CD and 3Vo are disconnected, so I hope this is not an issue. I've already tried to downclock my Teensy at 24MHz or to use the define SLOW_SPI in order to reduce the SPI speed at 15MHz, I've also manually change the SPICLOCK to 8MHz, but nothing the display seems dead. I was connecting Pin 10 to OLEDCS, but I realized (by mistake) that if I leave it disconnect at startup and then (after 3 seconds) I connect to SDCS everything works! Anyway this is an awful workaround since I have to manually disconnect pin 10 every time that I startup my Teensy and then connect it to SDCS (instead of OLEDCS). Both Chip Select signals for the OLED (OLEDCD) and the SD card reader (SDCS) are active low and would need to be active independently of each other. Using a pull-up resistor on each of these Chip Select lines will ensure they are both inactive on power up. I put two pull-up resistors as you suggested, but I still have problems. The SDCS is connected to a pin that it is always high, while the OLEDCS is connected to pin 10 (that is the SPI CS). I dump the two CS during restart with my oscilloscope, as you can see they seem to be stable high while it is rebooting. I got it working using two pull-down resistors (instead of pull-up) on OLEDCS and SDCS. 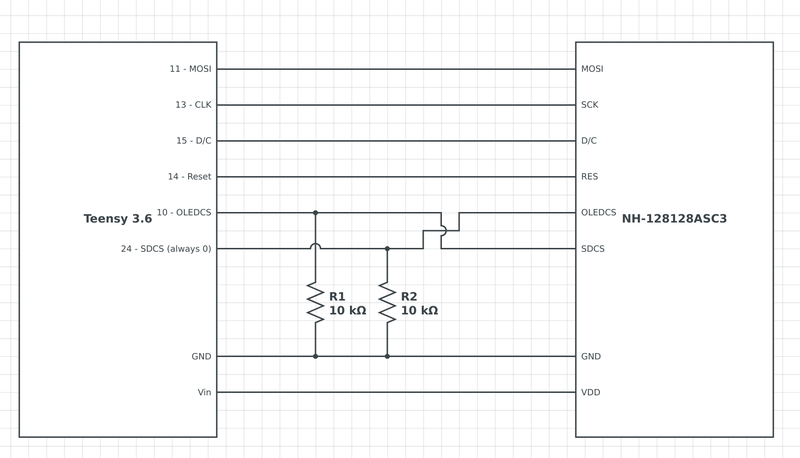 OLEDCS is connected to a pin always set to 0. SDCS is connected to my CS.